Pevensey Roundabout juction of A259 to Bexhill and to Pevensey, A27 to Brighton and Eastbourne and road to Wartling. Emergency services attended the scene of a two-car crash on the A259 at Pevensey this afternoon (December 8). The accident, near Pevensey roundabout, caused delays both eastbound and westbound. East Sussex Fire and Rescue Service and Sussex Police were called to the scene at 2.11pm. 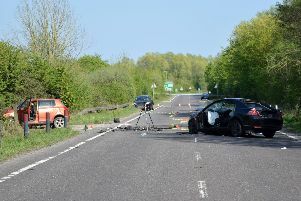 A police spokeswoman said, “Emergency services were called to a report of a two vehicle collision on the A259 Marsh Road at Pevensey.